HELLO folks! I’m back! It’s been a week since my last post and I really missed you – but I think I missed breathing the most! Even though I’ve been keeping in touch via my Facebook page, today is the first day that I really feel I’ve come out from under the cloud of the nasty flu! Some good that flu shot did me! Some of you may recall the photo book I used for my “you make the call” layout tutorial – here’s the finished product printed with MyPublisher and my first review of MyPublisher’s new lay flat option. According to MyPublisher’s site, for a limited time the lay flat add-on can be upgraded on any hardcover book for $25.00 for the 11.25 x 8.75 Classic photo book and $50.00 for the larger 15 x 11.5 Deluxe photo book. This is for any number of pages. How long the promo pricing will last is not disclosed. I also selected the full photo cover version known as photo finish. Interestingly the cover material is different from the first photo finish cover from MyPublisher that I ordered back in April 2010 when the feature was first offered. The first book had a type of matte, rubbery tactile finish. This cover is has a smooth finish, also matte (non-reflective) similar to the Photobook America book I have. These are different from the hard covers from Mixbook, Shutterfly, Artscow, Snapfish and Picaboo which are more high gloss and therefore reflective. I don’t really have a preference, but note that the matte covers do tend to mute the colors of the cover photos more than the gloss covers. Appears that the coating has a bit of a uneven cracked finish at the ridge. Recognize the custom cover I created (and reused!)? 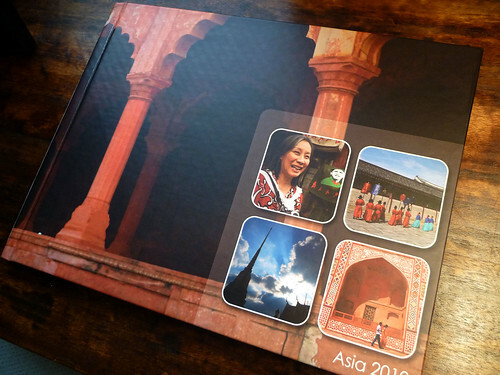 This cover layout features photos from the main stops: China, Korea, Thailand and India – a good way to set the stage for your vacation memory book as a whole. Remember you’re telling a story with your photos. The photos reproduced very well with accurate colors and saturation. Do all your adjusting in an external photo editing program. If your photo looks at all dark, make it brighter. In my experience, photos will print darker than the originals, with most photo book companies, so if it’s dark to start with, you won’t be happy if you don’t brighten it. 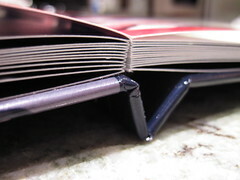 The MyPublisher lay flat binding is hinged. If you look closely you can see the thin strip of binding mechanism that attaches to the each side of the spread. The thin strip of binding that adheres to each side of the spread is most visible here, but is not as noticeable as it looks, unless you’re looking at it this close. There is a gutter, so if you did a manual two page spread (there is no option for an automatic two-page spread in MyPublisher), you would have a split in the middle of the page. 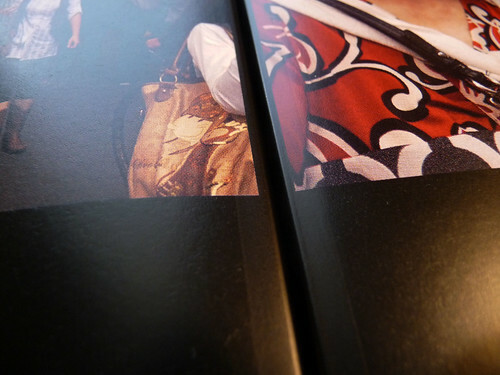 For comparison, here’s the profile view of the other lay flat photo books I’ve done. You can click on each photo below to go to the review of each photo book. I have an overview of lay flat books here. Use my Photo Book Wizard to find all companies in my database that make lay flat books! 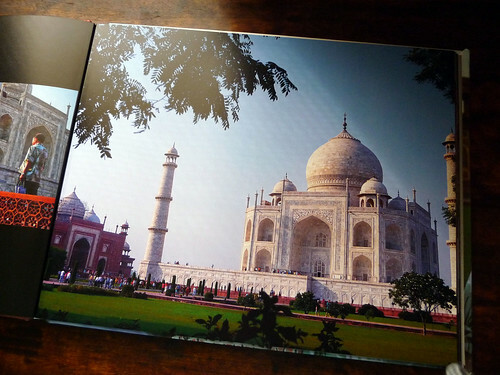 The most expensive lay flat photo book above is the MyPhotoCreations flush mount. But the quality is tops. 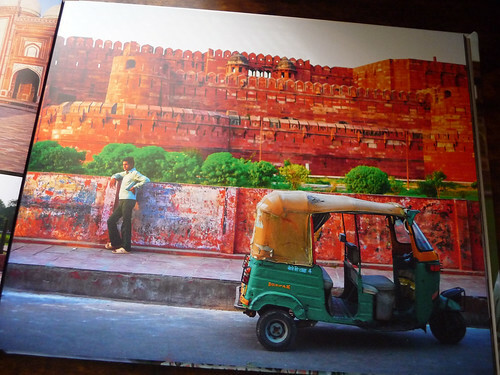 It has the thickest pages and it’s printed on real photo paper mounted on a heavy board. A flush mount book is really meant for special occasions so the cost reflects the quality. 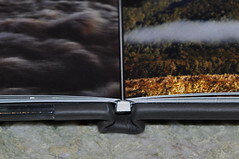 AdoramaPix has the most unique lay flat binding. 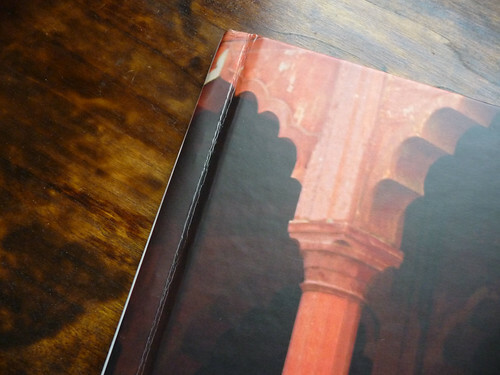 Unlike the other books, Adorama’s two-page spread is a single sheet folded in the middle – there is no gutter and you can design across both pages. All of AdoramaPix’s photo books are lay flat, so it’s built into the price and offers a high quality product (though not as high as a flush mount), for an economical price. I plan to do a more in-depth comparison down the line – I have a couple more lay flat books coming, so I’m waiting for those before I post! This book and its companion book (the second volume of this epic trip) was a gift to my family. I haven’t wrestled volume number 2 from them yet so no photos of that to show you at this time. My mom liked the lay flat pages and in particular was very happy to see her journey in print! 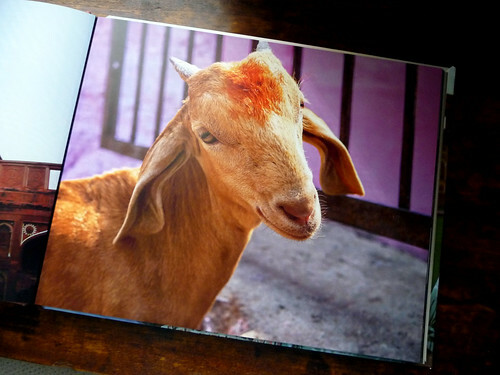 Have you tried MyPublisher’s lay flat photo books? Have you tried other photo book companies’ lay flat options? Have a favorite? The first layflat book I did was Adoramapix and really liked it. Then when I did one with My Photo Creations I didn’t know about the gap in the middle, and did quite a few two page spreads. That gap and seeing the black in the middle really breaks it up, and I don’t like it at all. Along with the pictures not lining up exactly. In the future I would not do two page spreads with a lay flat that have that gap and black in the center. Did you do any two page spreads in this book? Hi Sharon – which type of book did you do with MyPhotoCreations – was it the flush mount? Yes, I did a good number of two page spreads – if you click through to that post (click on the photo of the book for a direct link), you’ll see I did several of them. I didn’t mind the gap – I found it pretty small and it didn’t bother me. The key is to not put anything important (like a face) that would get split by the page. If you see in my 2 page spreads, there is nothing crucial in the center. However, it is a preference thing – you may have the same types of layouts as mine and you still don’t like it. I understand if you didn’t care for the split. So far I believe AdoramaPix is the only one I can recall that has no gutter in the middle. The book I did with My Photo Creations was the Ashbury photobook. And yes, the problem was I had crucial things in the center–it was wedding pictures, and I just didn’t know there would be a gap and that it might not match up exactly. I couldn’t find where to click to see your two page spreads. 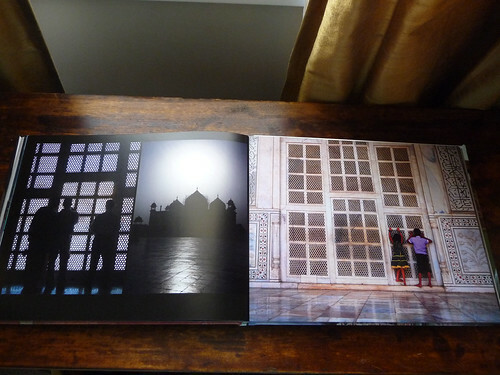 The shots of the book are in the MyPhotoCreations Review. Great post! I am currently putting together a photo album (stayed up until 3am before I finally just needed to go to sleep). I was wondering if this feature would be worth it. Seems so pricey … but if we have a lot of pages, perhaps it IS worth it! I’m sure my Mom would appreciate the flat pages. I just got my first adorama book! It looks fabulous! Thinking about making a MyPublisher one – How does page thickness compare between the two? The paper is quite different. 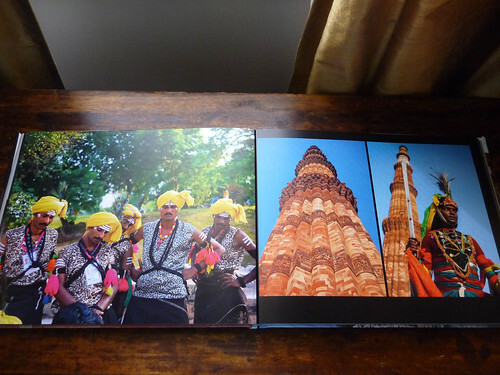 The AdoramaPix pages are coated and thick and are printed on real photo paper. The paper is glossy. If you click through to the AdoramaPix review and play the video – you’ll get an idea of how thick the pages are. MyPublisher has really good paper weight and thickness for a standard book, but the pages are not as thick as AdoramaPix’s and the pages are more matte. I like both companies’ products – it just depends on your project. AdoramaPix’s design software is a lot more sophisticated with more custom features. If you are okay with standard templates or you have your own external design software, then MyPublisher works really well. Thanks so much for sharing your knowledge! I am about to make my first photobook – I just did a google search and found MyPhotobook come up the most so made it in that. Wish I had found your blog sooner! One quick question, I checked Adorama – because I thin I would like the full-spread option (without the centre gutter) if going for a layflat, which MyPhotoBook doesn’t offer. However, the largest size I seem to see on Adorama’s website is 12×12, while MyPhotoBook offers 12×15. Is this correct or does Adorama offer a bigger size? Also, which would you recommend – I am making books for my wedding. I would like it to have the most luxurious feel in terms of page thickness and quality, but I actually like matte more than gloss in general. So Do you think the MyPhotoBook quality is good enough, or does it look “inferior” to the other options you’ve shared above? The size thing is a pretty important factor to me too – I would prefer the biggest possible size. I’m not sure I can tell which company you’re referring to – is it MyPublisher, or MyPhotoCreations or Photobook America, or maybe none of the above? Oops, sorry about that! I was referring to MyPublisher – this is the brand that came up most when I searched in Google and so that’s where I created my first book. However, came across your blog and am reconsidering whether to use another company before printing. Would be interested in your opinion on which would serve best for a wedding photo book. A key criteria for me is size. MyPublisher’s deluxe hardcover book is 11.5 x 15 – a quick look at Adorama and MyPhotoCreations suggest that they do not offer anything as wide as 15″ – is this true? If so, do you know of another alternate that does offer something that wide – or bigger? Thanks Photobook girl…for pointing me to those links! God, I wish I had found your blog BEFORE I invested all the time I did in making my books in MyPublisher (but haven’t bought yet). 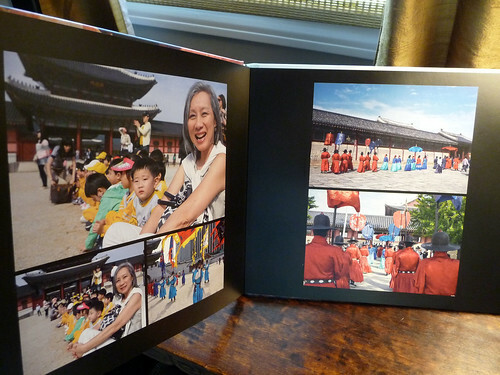 MyPhotobookAmerica seems to offer the largest size – the extralarge landscape imagewrap hardcover at 17.5″ x 12″. The paper sounds okay too and they offer an upgrade option to higher quality grades for $15. The other advantage here is it seems they offer up to 300 pages per book…currently, I have about 280 pages split across three volumes in MyPublisher…here, I could combine them all into one book. (As they are all from one event – my wedding, but it was a three-day affair with both Christian and Indian ceremonies, so while there is a natural break to have 3 volumes as I have designed with MyPublisher, it could also work as one book as it is all for one wedding). A big determinant there is of course price – MyPublisher ends up being quite expensive when being forced to split into three volumes (and I am buying three sets – one for us, and one for both sets of parents). However, your review of the paper qualities suggests that MyPublisher still wins out by far, plus I’ve already done all of the design work. So now I’m so torn! Do you have any advice? 🙂 What would you do? I really like both Photobook America and MyPublisher, so I don’t think you can go wrong with either. But because it sounds like you’ve already done your layouts in MyPublisher, I would go ahead and print them with MyPublisher. I am a big fan of “series” books. I like how they look like a set and you said that you have 3 distinct ways to break them up anyway. I’ve done a post on that topic here: http://www.photobookgirl.com/blog/multi-volume-photo-books-make-a-series/. The deluxe size with MyPublisher is already very large and you may want to check whether the dpi of your photos will be sufficient if you choose to do a two-page spread with a single photo (I did that in an outside program by the way)… I found that trying to do that made my photos grainy – so I probably won’t do any two page spreads in a book that large unless I know my photos have enough resolution to print out well in that extra large size. (we are talking about 30 to 34 inches across!) I discuss this topic in the link I provided on dpi above. Best of luck! Please check back in and let me know how it came out 🙂 P.S. before ordering all three books from MyPublisher – maybe you should print one and see how you like it first? NICE! I’ve never had a layflat book. The one from my photographer is going to be so I’m looking forward to getting that in a few weeks. I think it’s a good point about the price comparison. If you are making a larger book, why not add 25 dollars but if it’s a small amount of pages, might be harder to spend on the upgrade. Coupons/deals are great!! I recently ordered a lay-flat book from MyPublisher and had the same issue as Coryf (my images were cut off along the spine). They were good about it when I complained and did let me do a different version at no cost, and the quality overall was good. I have to admit, however, I was angry when I googled lay-flat my publisher and found they’ve had this issue for (at least) months and there was absolutely no warning in previews or checkout. I didn’t have a problem with the one I ordered but that was a while back and issues can pop up at any time I suppose. I do expect some gap with lay flat, but a large gap is not good and the preview should be accurate regardless. I hope they’ve fixed it! Have you reviewed http://www.paperkiwi.com ? Their lay-flat photobooks are quite reasonably priced! They’re featured in toptenreviews (under scrappingsimply) – sounds like their quality is good though price is low and website looks almost amateurish. No I haven’t yet – so many photo book companies out there! I am trying to make a wedding album, which one in your opinion is the highest quality? I want a lay flat with thick pages, that feels really luxurious. (Probably leather bound?) I noticed that my publisher has the thickest paper, but you also mentioned you liked myphotocreations. help? Flush mounts have the best quality. They are printed on real photo paper and lay flat. They also feature very thick board-like pages. You can’t compare MyPublisher to MyPhotoCreations if you aren’t comparing the same type of book (standard photo book to a flush mount photo album). That’s not to say that MyPublisher doesn’t make nice books, but materials used often accounts for the difference in price. (Books that start at $250.00 versus $29.99). Here are some more posts that I wrote on flush mounts. You probably want to look at the best quality for your budget. If it is a wedding book then I say it’s worth spending $250 and up you’ll see my wedding photo books here. I made a nice high end flush mount for myself, and then used MyPublisher and Blurb for parent and grandparent books. I called MyPublisher and asked about their 170 pt paper and they said it was thicker than 2 photographs back to back, but the paper in the album I received doesn’t seem that thick. Is 170 pts really thicker than 2 photos back to back? Does MyPublisher have the thickest paper out there? Do you know if any other company has thicker paper for photobooks? Thanks! 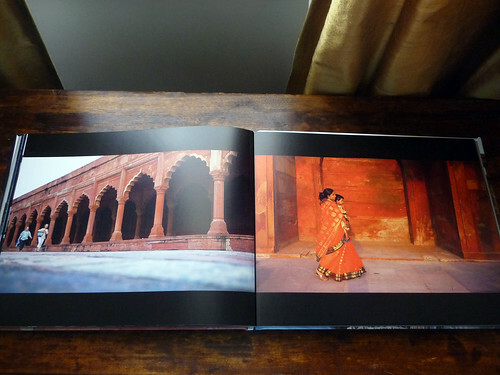 Check out this post: http://www.photobookgirl.com/blog/photo-book-paper-quality-compared-photo-book-company-prints-best-paper/ There have been changes in their paper since that post, but the last books I saw didn’t feel much different despite the new paper specs. I haven’t done a comprehensive update since the time of this post, but it is some of the thickest out there. Photobook America has some thick paper too (upgrade not standard). 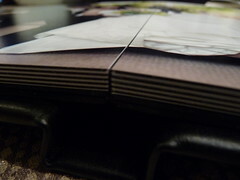 For the MyPublisher album did you opt for the satin or matte finish for the inside pages? I have a question about the outside of the binding of the MyPublisher books you received, to compare with my own experience. I’m not sure if I’m overanalyzing this or what. I ordered one book, classic hardcover, photo finish with the matte cover and with lay flat pages. It’s 82 pages, with the premium paper option (but not super gloss), so it seems fairly substantial to me. However the binding seemed to not have been pre-creased, so when I opened it, it ended up wrinkling/creasing unevenly across the binding area. I sent some pictures in of that a couple other issues, and they sent a coupon to replace it. In the meantime, I ordered 2 more copies to take advantage of a buy one get one sale. (These are my wedding pictures, so I am buying books for the parental units as well.) I got the glossy cover because the matte had seemed too prone to getting finger oil and dirt, otherwise same options and page count. I’ve received them and the binding seems pretty much the same to me. I was careful to try to make sure they creased in the right spot when I opened them this time, and that avoided much of the wrinkling I had before. It seems weird to me, though, and I’m starting to feel like I’m the crazy one. I tried to explain it when I sent the request in, but they didn’t make any specific comments in their reply, they just apologized and sent the code. It’s hard to explain, so I’m not sure I’m making a lot of sense. To me, it seems like the “dent” that I normally expect along the crease of the covers of hardcover books is missing. Additionally, it feels like the spine is somewhat narrower than the thickness of the book plus covers, so that contributes to the lack of dent. I expect a hardcover book to have the spine, then the cover narrows a bit where it hinges and where the pages are bound, the it widens out again where the stiffening material of the cover begins and it is again about the thickness of the spine. In the MyPublisher books I’ve received, it never seems to narrow, it just goes from the width of the spine to slightly wider where the stiffening material of the cover is. I’m sorry if this is kind of rambling, but I don’t have much experience with printing photo books, and I am not sure I’m using the right terminology. I’ll probably be sending them a message again, because the cover image on one of the new books is misaligned. I’d like to have a sanity check before asking them about the binding again, so any feedback you could share based on your MyPublisher books would be much appreciated. Maybe this is just the way they are? Maybe it’s because of the number or thickness of the pages? Though I would think they’d have accounted for that. I’m going to send you my email so you can email me a photo of what you’re talking about – I think I understand but unless I see it I can’t be 100% sure. Tamara, you are not crazy! I recently took advantage of a MyPublisher coupon and created/ordered my preschooler a photo book of her recent trip to the aquarium. Since it was a book for little hands, I upped the paper weight (like you) and had a similar number of pages (72). 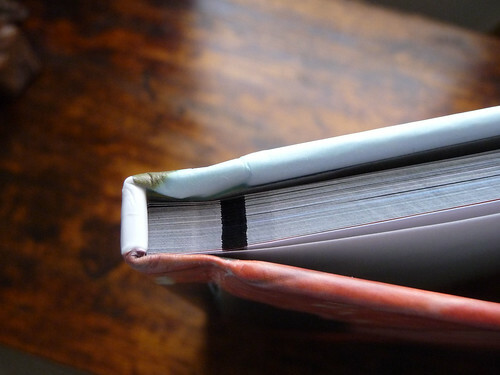 When I got the book, while the pictures were beautifully printed, the binding seemed insufficient to hold that many (thick) pages and bubbled/crinkled at the spine/crease. So you are not the only one out there with that issue! I contacted MyPublisher and after a lot of unanswered questions about how to resolve the issue, the company just refunded my purchase cost. Jamie, Did your book look like the photo I posted second from top? I did have some crinkling in my binding too, but it didn’t look as bad as Tamara’s. I do plan on ordering books within the next month for myself, and I’ll see how they turn out and update. Oh Photo Book Girl, it looked far worse than that. The bubble is, at the thickest part, over two centimeters wide. I am sure it is just a fluke, but it was discouraging to say the least! 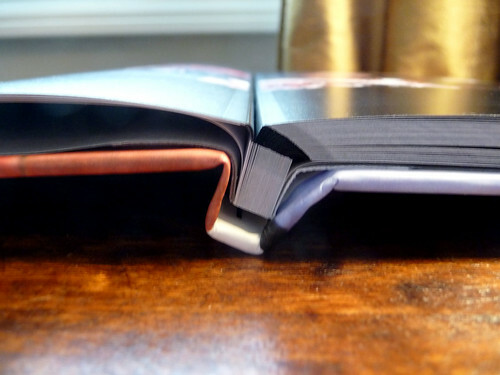 The spine was really just not big enough to hold the number/thickness of pages I put into the book. I am working on recreating the book with Blurb, as I have been very impressed with their spine widths and page thickness! Thank you again for all of your hard work for these reviews! No problem – good luck on your book! No I haven’t. The most recent books I ordered were given as a present and I didn’t keep them long enough to do a review. They were lay flat but I don’t think I upgraded the paper. Are you planning to do the deluxe size? The thicker paper in there has worked fine for me. I think you may be wondering about the thicker paper in the smaller size? I have read your review on AdoramaPix on another topic and was really impressed with thickness of the papers they offered. However, I’m personally not interested in the glossy paper. From what I have read on their site, they only offered 2 types of papers :Professional Luster Paper & HD Glossy Album Paper, so I wonder which on of these are more matte, and why is latter more expensive? Your recommendations are GREATLY appreciated!! It fits all but #2 – it is lay flat but there is a small gutter. You can still do two page spreads but there will be a separation – I’d just recommend not putting someone’s face in the gutter. This is what I would do if I could do it again. I actually used them for my book, but at the time I don’t think they had lay flat or I would have gotten it. There are a lot of deals on my deals page for this company so best of luck on your book. As for Shutterfly, there is a lay flat option now that does not require you to buy the premium style (so no leather cover). It’s the regular cover with the lay flat pages. I think you’ll get better print quality on the MyPublisher one however. 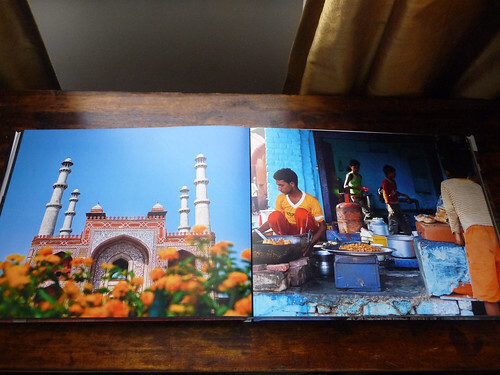 I ordered a photo book from MyPublisher a couple weeks ago and am really disappointed in the picture quality. I was using rather large files of my wedidng pictures, so there should not have been any problems due to resolution/dpi. Fortunately I got it using a Groupon, so I saved quite a bit off the regular price, but still not worth the price in my opinion. The paper didn’t seem all that thick to me and the photo cover was misaligned, so the white background from the spine bled onto the back cover and the text on the spine wasn’t centered. Definitely not what I was hoping for and i think I’m going to cough up the money for a flush mount album. Hi Rachelle, If you have any issues with your book I would definitely ask for a reprint – just be sure to do it within the time frame for return (I think 14 days). They usually don’t have you send it back, you may just be asked to snap a photo of the issue and email it to them. It’s worth doing if it fixes the issue and they should do that for you! This one is 11.25 x 8.75″ which is the Classic size.